The Cats’ Cairn (NG271526) is said to mark the grave of a young boy from the 18th century, who was buried where he died and its story is told elsewhere on TNA. 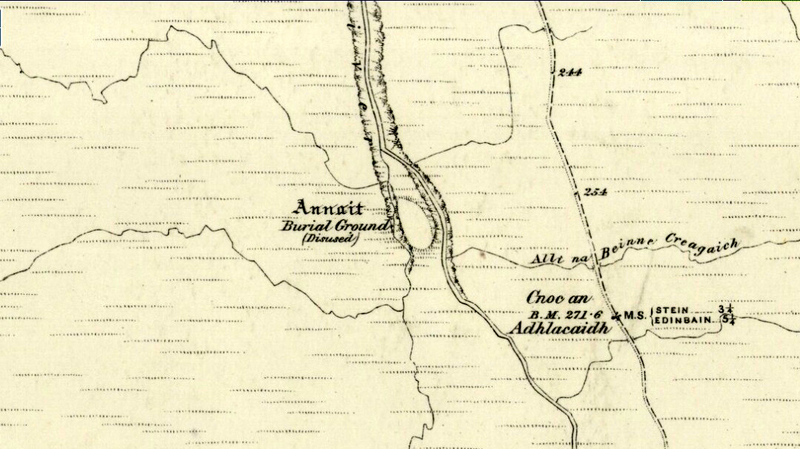 Another example of the Annait place-name can be found elsewhere on Skye at the megalithic site, Clach na h’annait. Boswell, James, The Journal of a Tour to the Hebrides with Samuel Johnson, National Illustrated Library: London 1899. Swire, Otta F., Skye: The Island and its Legends, Blackie: Glasgow 1961. Watson, W.J., The History of the Celtic Place-Names of Scotland, Birlinn: Edinburgh 1993. This entry was posted in Inverness-shire, Scotland, Skye, Stone Circles and tagged Anait, antiquarian, antiquities, Archaeology, druids, Duirinish, Dunvegan, earth mysteries, folklore, goddesses, gods, heritage, Inner Hebrides, Inverness-shire, Isle of Skye, legends, Lusta, megalithic, Megaliths, place-names, prehistoric sites, sacred sites, Scotland, Skye, Stone Circles, Trotternish, Waternish. Bookmark the permalink.